China's defense ministry expressed its "strong dissatisfaction" with the United States, criticizing an annual report by the U.S. Department of Defense as misrepresenting the country's military development. The Defense Department report to the U.S. Congress, issued Friday, said that China was focused on developing and weaponizing the islands it has built in the disputed waters of the South China Sea so it will have greater control over the maritime region without resorting to armed conflict. On Saturday, Defense Ministry spokesman Yang Yujun told the state news agency Xinhua the U.S. report on China's military activities in 2015 had "willfully distorted China's national defense policy." "China follows a national defense policy that is defensive in nature. Moves such as deepening military reforms and the military buildup are aimed at maintaining sovereignty, security and territorial integrity, and guaranteeing China's peaceful development," Yang said. 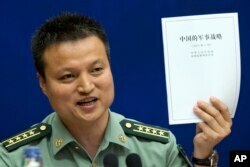 FILE - China's Defense Ministry spokesman Yang Yujun holds up a report on China's Military Strategy in Beijing, China, May 26, 2015. Yang criticized a U.S. report assessing China's island-building efforts in the South China Sea. The Pentagon report accused China of "increasingly assertive efforts to advance its national sovereignty and territorial claims" and a lack of transparency about its growing military capabilities, which are causing tensions with other countries in the region. The Philippines, Vietnam, Malaysia, Taiwan and Brunei also have claims to parts of the sea. 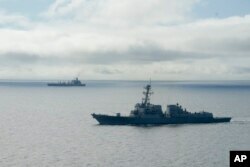 The U.S. has said it takes no side in the territorial disputes, but supports freedom of passage in the area, through which $5 trillion in ship-borne trade passes every year. Yang said the report hyped up "China's military threat" and unfairly depicted China's activities in the East China and South China seas. He accused the U.S. of being overly suspicious in its claims. In speaking to reporters at the Pentagon Friday, Abraham Denmark, the U.S. deputy assistant secretary of defense for East Asia, said the report's "facts speak for themselves. 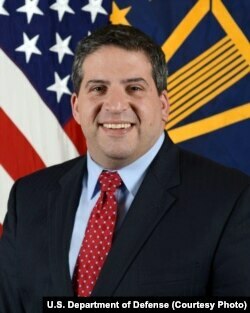 ... China continues to focus on preparing for potential conflict in the Taiwan Strait." Denmark noted trends in the report. He said Beijing had used assertive tactics to reclaim existing outposts and began building military facilities on large swaths of land in the South China Sea in 2015. "China's leadership demonstrated a willingness to tolerate higher levels of tension in pursuit of its maritime sovereignty claims," Denmark said. "China's strategy is to secure its objectives without jeopardizing the regional peace that has enabled its military and economic development, which in tum has maintained the Chinese Communist Party's grip on power." • China's growing global military presence. "China's leaders are leveraging the country's power to expand its international influence -- and its military footprint overseas," Denmark said. The report noted China's November announcement that it was establishing a military facility in Djibouti, in the Horn of Africa. It said China was also expected to establish naval logistics hubs in countries with which it shares interests, including Pakistan. "This is a big step forward for the PLA [People's Liberation Army], which has never had an overseas facility before," he said. Denmark also said China's 2015 defense spending was higher than it publicly disclosed and had reached $180 billion, compared with an official Chinese of $144 billion. The Defense Department, in its most detailed assessment of China's island-building program to date, found that three of the land features in the Spratly Islands now have nearly 10,000-foot runways and large ports in various stages of construction. It also found China has excavated deep channels, created and dredged harbors, and constructed communications, logistics and intelligence gathering facilities. The report estimated that China’s reclamation work has added more than 1,300 hectares (3,200 acres) of land on seven features it occupies in the Spratly Islands in the space of two years. The report said additional infrastructure, such as communications and surveillance systems, is expected to be built on the islands in the coming year. “China will be able to use its reclaimed features as persistent civil-military bases to enhance its presence in the South China Sea significantly," it said. The accelerated building effort doesn't give China any new territorial rights, the report stated. 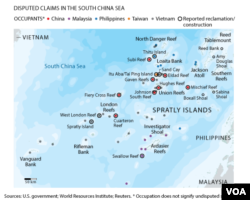 But it allowed that the airfields, ship facilities, surveillance and weapons equipment will allow China to significantly enhance its long-term presence in the South China Sea. Chinese officials have defended the land reclamation by saying it is Beijing's territory, adding that the buildings and infrastructure are for public service use and to support fishermen. FILE - The USS William P. Lawrence guided missile destroyer, below, awaits refueling from a tanker, above, off Coronado, Calif., Jan. 20, 2016. ​Yang also accused the U.S. of flexing its military muscles by frequently sending military aircraft and warships to the region. As recently as May 10, the U.S. Defense Department sent a Navy warship to carry out a freedom of navigation operation in the disputed South China Sea, sailing the USS William P. Lawrence within 12 nautical miles of Chinese-occupied Fiery Cross Reef. While Washington has accused Beijing of militarizing the South China Sea, Yang said it is the U.S. that has increased the militarization in the region with such actions. Also, the U.S. report renewed accusations against China's government and military for cyberattacks against U.S. government computer systems, a charge Beijing has denied. The Pentagon said attacks in 2015 appeared focused on intelligence collection.